The Slim-Fold Cook Station™ is designed with GCI's patent-pending Slim-Fold Technology™. The Cook Station sets up and breaks down in a flash with its hassle-free one-piece design. 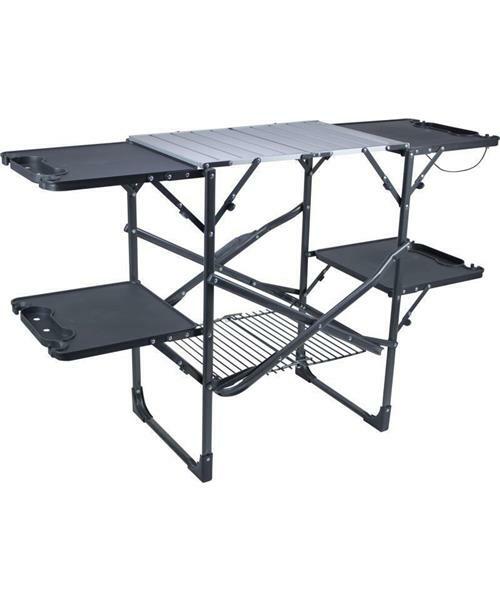 It has an aluminum counter top, a lower rack for storage and four plastic fold-out side tables. The side tables have many features including beverage holders, stem glass holders and hooks that can be used as a garbage bag holder or to hang cooking utensils.